A Texas man wrote an impassioned blog post for the Houston Press after his five-year-old daughter was told by staff cover up her sinful shoulders and legs with a t-shirt and jeans. Writer Jef Rouner sent his daughter to school last week wearing a full-length rainbow dress with spaghetti straps and carrying a backpack containing a change of clothes, so he expected she might have put them on eventually. What he wasn’t expecting, however, was the reason for it. “Did you get cold, sweetheart?” I asked her. 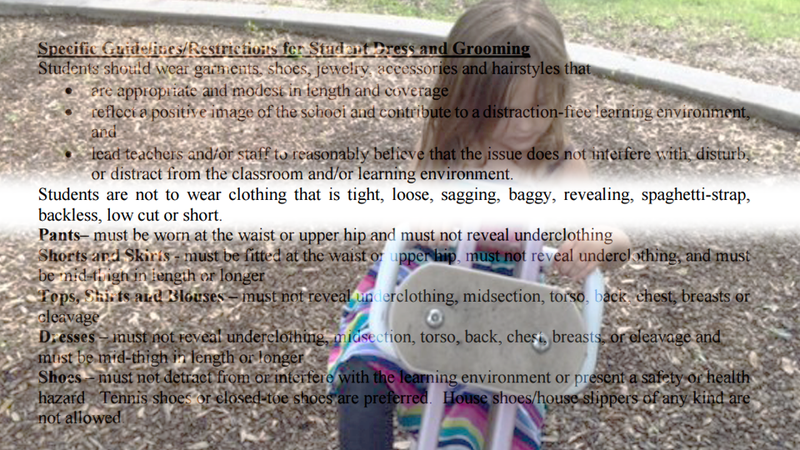 Have you ever stopped to think how weird a school dress code really is? I went and checked out the one for my daughter’s school district and it’s amazing in how hard it tries not to say what it actually means. There are literally no male-specific guidelines anywhere on that list. ...a school dress code exists to prevent girls from displaying too much of their bodies because reasons. Rouner ends on a positive note, however, announcing that he will use the whole thing as a learning experience for his daughter. The next time the kid wants to wear her dress I’m going to let her, and I’m going to tell her that there’s nothing wrong with it or her because she is dressed in a perfectly normal manner and cute as a button to boot. I’m going to tell her that some people think a girl who shows too much skin is wrong or dangerous, but that those people are, for want of a better term, lackwitted thugs living in a bad place. And if anyone tells her to change I’m going to advise her to ask why and to keep on asking that person “Why?” until she gets an answer she likes. She’ll probably be asking for a while.